China's Hard Landing Has Already Begun! 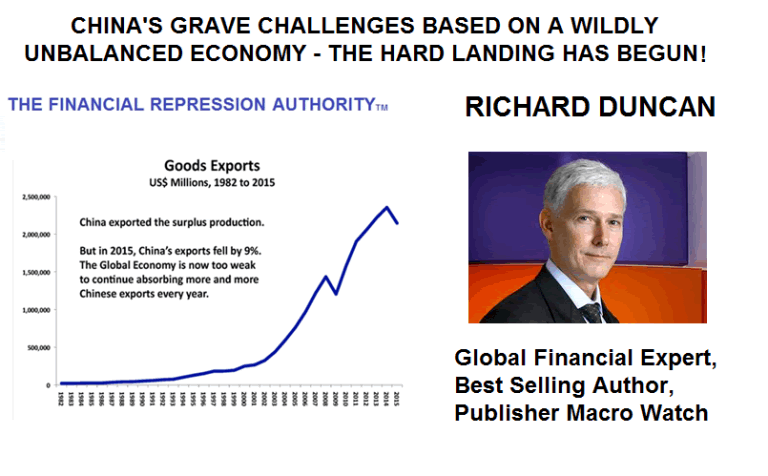 The Financial Repression Authority is joined by Richard Duncan, an esteemed author, economist, consultant and speaker. FRA Co-founder, Gordon T. Long discusses with Mr. Duncan about the current Chinese situation and the ramifications being imposed on the global economy. Richard Duncan is the author of three books on the global economic crisis. The Dollar Crisis: Causes, Consequences, Cures (John Wiley & Sons, 2003, updated 2005), predicted the current global economic disaster with extraordinary accuracy. It was an international bestseller. His second book was The Corruption of Capitalism: A strategy to rebalance the global economy and restore sustainable growth. It was published by CLSA Books in December 2009. His latest book is The New Depression: The Breakdown Of The Paper Money Economy (John Wiley & Sons, 2012). Since beginning his career as an equities analyst in Hong Kong in 1986, Richard has served as global head of investment strategy at ABN AMRO Asset Management in London, worked as a financial sector specialist for the World Bank in Washington D.C., and headed equity research departments for James Capel Securities and Salomon Brothers in Bangkok. He also worked as a consultant for the IMF in Thailand during the Asia Crisis. He is now chief economist at Blackhorse Asset Management in Singapore. Richard has appeared frequently on CNBC, CNN, BBC and Bloomberg Television, as well as on BBC World Service Radio. 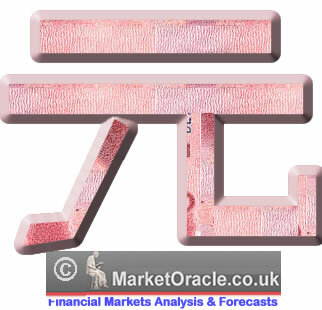 He has published articles in The Financial Times, The Far East Economic Review, FinanceAsia and CFO Asia. He is also a well-known speaker whose audiences have included The World Economic Forum’s East Asia Economic Summit in Singapore, The EuroFinance Conference in Copenhagen, The Chief Financial Officers’ Roundtable in Shanghai, and The World Knowledge Forum in Seoul. Richard studied literature and economics at Vanderbilt University (1983) and international finance at Babson College (1986); and, between the two, spent a year travelling around the world as a backpacker. China is really just running into a brick wall. If they continue to have more and more credit growth, it will only exaggerate their problem. This is essentially the nature of China’s current problem. A stock market crash, diminishing returns on credit, a plunge in imports, capital flight and currency volatility are all signs that China’s great economic boom is now coming to an end. In all probability, this is just the beginning of what is likely to be a very protracted economic slump. China’s economy need not collapse into a Chinese Great Depression to produce a global economic crisis, although the possibility of economic collapse in China cannot be ruled out. The 17% contraction in Chinese imports last year was already enough to tip the global economy into recession. The consequences of this economic hard landing in China will be felt in ever corner of the world. Despite the efforts of quantitative easing, it did not help or facilitate much benefit to China. This is largely due to the fact that China’s economy is so large. There is a large gap between how much China produces and how much China consumes. From 2005 to 2014, China invested $4.6 trillion more than it consumed. If we look at aggregate financing it reveals a much more detailed story of the credit growth situation in China. Since 2009 credit growth has been significantly slowing, and once this began, so too did nominal GDP growth begin to decline. 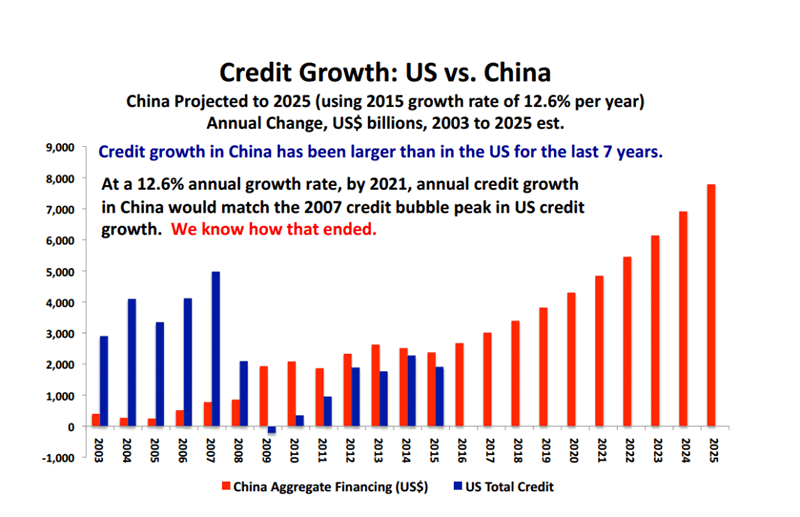 If credit growth in China continues to grow then by 2021, total credit growth in China will be more than the peak credit growth the US had back in 2008. The Gross Output Value of Construction increased by 134 times, growing at an average annual rate of 21%. Building Area Under Construction increased by 33 times, at an average annual rate of 15%. Steel Production increased by 12 times, at an average rate of 11% growth per year. Consequently, China now has 50% of global steel capacity. Cement Production increased 12-fold, growing by an average annual rate of 11%. During just three years (2011 to 2013), China produced more cement than the United States did during the entire 20th Century. China now has 59% of global cement capacity. On the other hand many would believe that if China devalued the yuan, it would bring in more capital investment, but this is not the case. If they had one big devaluation it would make china much more competitive in the global economy. The trade surplus will soar and bring in more money into china. But at the same time China’s trading partners would not be pleased because China already has a large trade surplus with the rest of the world. So too devalue further only to make the already large trade surplus even larger would be unfair by anyone’s standards. The buyers who are absorbing the treasuries being sold at are really people just fleeing negative interest rates. Rather than take a negative yield, they would rather buy US treasuries at a pathetic 1.7% on a 10yr. The reason China’s forex reserves are falling is because Chinese people want to sell Chinese yuan and buy dollars. And with these dollars they want to buy treasury bonds. I do expect there to be a steady depreciation in the yuan coming in the near future. But much of this depends on what happens to the dollar. It is very clear that if the dollar goes up, the yuan is going to go down and this is a problem because the more the yuan goes down then the cheaper the Chinese goods will become compared to the US. Therefore making it more difficult for the fed to reach its mandate of 2% inflation. The green shows that China’s’ economy made up 13% of the global economy. 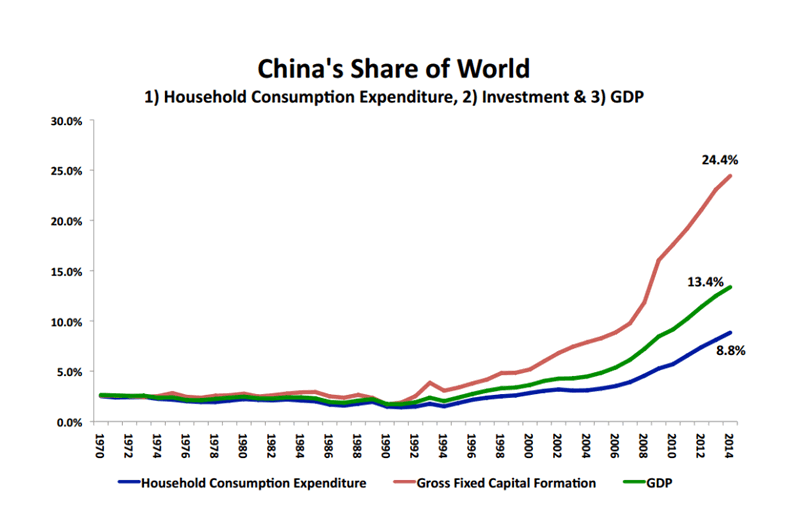 But Chinese household consumption made up only 9% of global consumption, while investment made up 24.4% of global investment. This is mind boggling because its telling of investment in all kinds of structures which create jobs. What Chinese authorities are telling is that they are consequently going to move from investment driven growth into consumption driven growth, but this again is just not possible because if you begin laying off factory workers, then these people will consume less, not more. If investment slows as it must, then consumption will also slow. So in order to have any growth at all, Chinese spending will need to sharply increase. When Chinese imports are growing, china then becomes a significant driver for global economic growth. But last year Chinese imports contracted by a staggering 17%. Brazil is now suffering the world depression in 100 years because commodity prices have crashed due to lack of Chinese demand. The effects of this import contraction are clearly being felt and it will be global. All around the world we are seeing a rapidly growing backlash against free trade and the rise of anti-free trade candidates on both the right and the left.